Welcome to AutoTweet and Joocial 8! After 6 months of research and development, we have finally released AutoTweet and Joocial 8. AutoTweet and Joocial 8 are our renewed platform to enhance your social media management as never before! The biggest social hub for Joomla, leading to new heights. To follow this new road, we took the decision to release periodic beta releases for version 8, add new features, and finally replace the venerable version 7. This development strategy allow us to innovate and prepare a new platform for a new technology iteration of new powerful features. Joomla 2.5 compatibility mode is gone. Users still on Joomla 2.5 must remain on AutoTweet and Joocial 7.9. 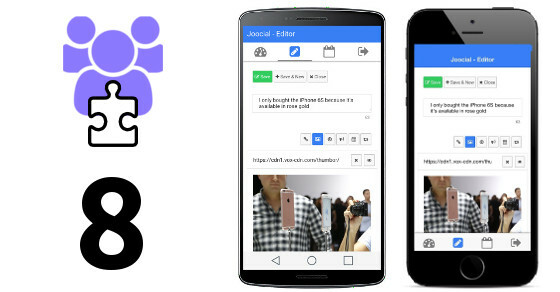 Integration with Joocial Composer App, to take advantage of mobile added-value features for Android and iOS, powered by JoomGap. Composer and Item editor have been rewritten to be optimized and support new functionalities. On top of this fantastic roadmap, we have packed on this new build the sum of matured social plugins from the traditional branch. Together, AutoTweet and Joocial version 8 deliver 60+ social plugins, including the latest plugins for CMGroupBuying, JV-LinkDirectory, Matukio and phpBB/ p8pbb. The future looks bright and the times ahead are exciting. This is our new platform for social content management. We have already started planning for the next version and intend to amaze you with every new release.